I have large healthy Hydrangea with lots of foliage but no flowers. Why? 1. Too much shade-all grow in partial shade but too much will reduce or eliminate bloom. 2. Too much fertilizer-too much nitrogen will promote healthy green leaves at the expense of flowers. 3. Winter damage- If you live in the cooler climates, the flower buds may have been damaged from freezing temperatures. Only smooth (H. arborescens) and panicle(H. paniculata) hydrangea bloom on new wood; bigleaf hydrangea (H. macrophylla) blooms primarily on old wood (*with the exception of new remotant bloomers ) which means that they need to set their buds in the current season and make it through the winter to bloom the following year. *New cultivars of H. macrophylla, such as Endless Summer, Twist n Shout will bloom on old growth as well as new growth. 4. Pruning – be aware of the timing. Judicious pruning is important. Too much and late pruning will eliminate next years flower buds. If you prune to reduce the height, do so right after blooming. If you prune to thin out the plant, cut some of the oldest stems to ground level in the early spring(dormant season). Most hydrangeas grow well with no pruning at all whereas others such as H. arborescens (Annabelle) and H. paniculata (Pink Diamond) usually need to be cut back every year. When is the best time to cut back Hydrangeas? The best time to prune is early spring and immediately after flowering. It helps to know what kind of Hydrangea you have to know how much to prune. H.arborescens blooms on new wood, so you can cut it down to 1/2 size or 6″ above the ground in the winter or early spring. No pruning will give you less vigorous growth and smaller flowers. H. paniculata – same as H. arborescens. H. macrophylla Bigleaf hydrangea- blooms on old wood (except for Endless Summer, Penny Mac and All Summer Beauty). Prune only to remove spent flowers. Cut right below the flower head. Any other pruning will reduce flower production for the next season. The more you cut the less flowers you will get. H. quercifolia, Oakleaf hydrangea blooms on old wood -prune same as H. macrophylla. Prune in early spring to shape or thin the plant at the expense of flowers. I read on a post that I could prune mop heap hydrangea that I could prune these in June and July, so I pruned it. Now the leaves are turning brown. Pruning lightly after bloom should not cause the leaves to turn brown. There must be some other cause – possibly too much sun, fertilizer, not enough moisture or disease. I need more information. Does the browning start on the edges of the leaves? Is it spotted? Hi, I live in malaysia and it is hot and humid here. I bought a pot of (rheignland mophead hydrangeas i guess ?) from a local plant nursery. The shopkeeper told me to place them under full shade, but I found out some information saying NO HYDRANGEAS DO WELL IN FULL SHADE , and that I should place them under a spot that receives morning sun and afternoon shade , but the problem is, my garden does not receive any morning sun , and if I place them under afternoon shade, they will start to droop . What should I do ? Atlanta Georgia here- planted two each of Endless Summer the original ( Bailmer ) and H. Marcrophylla ( Blue Billows )- planted in mid Sept. First Frost last weekend Nov 5th . Now the leaves are browning. I am new to Hydrangeas and wonder what I should do for winter- for the plants health overall and also of course for the most blooms. Thank you for any wisdom to a newbie. I hear the Endless Summer will bloom on new growth but the regular broadleaf will not- I can really only find info on winter care for northern climates. Hydrangea will grow well in the mild climate of Atlanta. It’s in northern climates that they need extra winter protection. Your hydrangea will drop its leaves and go dormant. For winter protection place 2-3 “of mulch around the base of the plants staying away from the center stem. Fertilize, in the spring when you see new growth. Should I transplant my plant in a shady spot? I live in the San Francisco Bay Area and have recently planted a hydrangea plant in a location that gets full sun light, primarily because the soil is better at this location. I have clay about 12 inches under the soil throughout the yard and often times in the winter the water just sits on top of the soil after a hard rain. Any suggestions area appreciated. Most hydrangea will tolerate full sun to light shade as long as they get enough moisture. It depends on which hydrangea you planted.The H.paniculatas do well in full sun. It sounds like the better alternative than planting in clay soil that doesn’t drain well. i live in middle tennessee and have a fairly young hydrangea bush that has black spot on all the leaves, and some white mildew also. I know I should probably spray it with a fungicide, but do I need to remove the leaves,leaving bare branches or should I just wait and prune the whole bush later this winter? The bush is about 3 feet tall.The variety is a pinky winkly. Next year start spraying with a fungicide when you first notice any brown spots on the leaves usually mid summer. Remove only the leaves that have dropped on the ground. The rest will drop on their own and remove them later. “Pinky Winky” belongs to H. paniculata and blooms on new growth, therefore can be cut back in late winter. My Annabelle blooms and the leaf is brown and brittle, our temps have been in excess of 90 degrees this year quite often. They are watered by sprinkler system every other day around 4am. They have been in the ground 1 year. May I add iron to them in October? They haven’t been over fertilized, maybe 4 times total from May to July. Im speculating it’s a watering issue. So I just want to add iron for now, and prune a little after it goes dormant. Im I ok to do so? Watering can be the issue but it sounds as if your plant has been over fertilized. You don’t mention what the dosage was but 4 x from May to July is too much. Fertilize once in the spring should be sufficient. I’m not sure why you want to add iron to the soil. At any rate, fall is not the time to fertilize your shrub, wait until spring when the plant will be ready to use it again. Hi I live in streamwood, Il and this April I planted Hydrangea Anabelles. I baught them as 2 quart pot size plants and planted them in my front yard. I had couple of questions. 1) How long will they take for them to bloom? 2) The leaves on one of the plants is browning and curling up, why? and should I cut those leaves off? 3)DO I have to do anything for the winter to protect them? Annabelle hydrangea bloom in Aug. They are done for the year. The plant is going dormant for the year. Add 2-3 inches of mulch around the plant after the ground freezes. Annabelle hydrangea blooms on new wood, therefore you can cut the old stems to 6 inches above soil line in winter and still have flowers. Fertilize in the spring when new growth appears. I have two Kaleidoscope Hydrangeas. I live in upper Michigan. One plant will get big and not bloom, there aren’t even any buds on it, but the leaves look great. The other plant is small in size but has great looking leaves. This one won’t bloom either or even produce buds. They get sun/shade and are about 4 feet apart from each other. I was told they were planted at the same time. They have been in the same spot for years and no blooms. Located behind them about 10 feet are 3 pine trees. We live in the woods in a marshy area. For the winter we cover them. What do I do to get blooms? Kaleidoscope hydrangea belongs to Hydrangea macrophylla cultivar, Hovaria series. One of the major problems with them is the lack cold hardiness ( zone 5b-11). Eventhough you are protecting it in the winter, it may not be enough to protect the flower buds which bloom on old wood. If hardiness is not an issue then consider some other factors that affect blooming. 1. not enough sun exposure 2. too much nitrogen fertilizer 3. improper pruning. For winter protection mulch it with pine bark, leaves. One elaborate way is to trim the foliage and tie the stalks together and then slip a plastic collar (made from a nursery pot) over the plant and fill it will mulch. For additional protection, wrap the tied stems with landscape fabric. This will keep the crown and stems snug and cozy for the winter. For larger plant make a collar from a small garbage can(open top). Wrap mesh hardware cloth around the cone or can to keep it in place. Another way is to wrap it with hardware cloth or chicken wire and fill it with pine bark and then wrap the outside with permeable landscape cloth or burlap. The insulation should be able to â€œbreatheâ€ and maintain an even temperature. If a plant is wrapped in plastic it can get too hot in the winter sun and then freeze when night temperatures drop. I planted 3 endless summers this morning and I am afraid I did not plant them deep enough. The base of the plants were above ground level about 2-3 inches. Also, being a complete beginner, I did not loosen up the roots of the plant just put in as it came out of the container. I used some planting soil but not a whole lot. I wonder- will they root ok? The original soil is like clay- thick and rocky. What do you think? Can I do anything at this point? Thanks so much! If you planted it at the same level as it was in the container, then you should be fine. If not, 2-3 ” above the soil line may be ok, only because you mentioned that you have clay soil which will not drain well. Add about 2″ of mulch around your hydrangea, keeping away from the main stem, to maintain evenly moist soil during the summer. A transplant root starter(4-16-8) will also help speed up root development. Be careful not to overwater and avoid soggy soil. I did try the scratch test, and there’s a only hint of green. I’m not sure if it means there’s some life! When I was re-potting, the roots looked healthy, so I’m going to leave it alone for a bit… and if nothing happens after 2-3wks, it probably is dead. Thanks for your comments- I know better for next time NOT to leave the pot outside! Some hydrangeas are hardier than others, that’s why its important to know which one you have. I suspect that yours is in the H. macrophylla group which are not as hardy. I had 2 hydrangeas(H. macrophylla) same cultivars -one was planted in the garden and the other stayed inside. To my surprise the outdoor hydrangea survived the winter, (most likely because it had good snow coverage) and is growing from the roots, the stems are dead. Because its growing from the ground it will not bloom this year because it doesn’t have old wood. The one indoors has old wood and is in bloom. I bought a Hydrangea sapling from Walmart last year & it produced beautiful pink blossoms in summer. Reading that it’s best not to cut the flowers off, and noticing small green ‘bulbs’ on the stalks, once the temperature dropped to 10deg at night, I wrapped the pot in newspapers & bubble wrap to overwinter on my balcony. Last week when I unwrapped the pot, I noticed web-like mildew (?) on the stalks, which are all hardened & the ‘bulbs’ are shrunken & brown. I cut the dried blooms off & re-potted the plant in fresh soil- I’m wondering whether there’s any point in having done that if the plant died? How would I know if it is dead?? The part where I cut off the blooms has a hint of green, but it does look like it’s all hardwood. Thanks for any advice on what I should do, other than wait & watch if anything happens! Do the scratch test. Scratch the trunk to see if there is any green. If you are seeing some green, then the plant is not dead. The bud cover turns brown over the winter, but there should be some green inside the bud that will swell and sprout new growth. This all comes from old wood. If it looks like there is new growth , place the plant in a warm sunny area and water. Once it starts to grow feed it with 1/2 strenght acid fertilizer. I let my hydrangea go dormant in the basement (lost all its leaves) and in spring the buds started to swell so I made sure to bring it to light and watered/fed it. I did not transplant it (probably should have but will after bloom). It’s almost ready to bloom. I kept another hydrangea in the kitchen-did not grow but kept its leaves during the winter. Did the same thing in spring when new growth started. It is also ready to bloom. I have a large white lacey hydrangia;the leaves or turning brown on the edges. There are some stalks that are dying. We have had a very hot dry summer in Texas. I have not fertilized in a couple of months. What should I do about this. Mostly likely the brown edges were caused by drought stress. Salt burn and soil compaction can also cause the same symptoms. Hi: I have bought two Panicle Hydrangias. Two questions. 1) What kind of fertilizer should I use when I plant them? 2) Any other special planting info you may have would be appreciated. We live in Eastern Ontario Canada. 1. The only fertilizer you can apply after mid-August is a root starter to stimulate new root growth before winter. If you promote new leaf growth, it may not harden off before winter. Otherwise, fertilize your hydrangea with a 10-10-10 in late winter to e. spring before growth starts. Spread the fertilizer at the base of the plant. 2. For planting ideas see the article on Endless summer hydrangea. I have white hydrangeas that have turned green. (I don’t know the variety of hydrangea) What can I do to maintain the white or change the color to blue or pink? I’m guessing that you have a Annabelle hydrangea. They produce rounded flower heads and have a tendency to flop over. When Annabelle hydrangea flowers mature, they turn a green color and if you leave them on longer they will dry and turn a tan color. Next year they will again bloom white flowers. H.arborescens”Annabelle” blooms on new wood, so you can cut it down to 1/2 size or 6â€³ above the ground in the winter or early spring. This will help produce stockier stems and more flowers. No pruning will give you less vigorous growth and smaller flowers. You cannot change the color to pink or blue on this variety. live in NE Tennessee and have a large 3 year old mop head hydrangea that I would like to transplant. When is the right time to transplant and should it be pruned back or try and transplant it in its current size? Best time to transplant Hydrangea is early spring before it buds or in the fall when the plant is dormant. Any other time you can put the plant in shock and it may have a difficult time recovering. When you do transplant irrigate and baby the plant like a new planting. When digging up your hydrangea try to get as much of the rootball as possible. Unless you prune or trim your mophead hydrangea right after bloom, you may be cutting off next years flowers. What you need to do is pick out one straight dominant stem and remove all others. This will focus all energy on the main stem. As the stem grows and gets taller, remove any side shoots or growth that may show up on the stem but leave the top growth. This process takes a few years. It’s just like making a topiary. We have a pink diamond hydrangea. It is a tree type hydrangea. How do we train a new center leader to get the tree to grow taller. We appreciate any insight you offer. I am assuming that your Pink Diamond hydrangea is already in a rounded tree form at this time. Do you want to keep it that shape or do you want a more triangular form? Once the hydrangea stops blooming, it will continue to grow making it larger overall. Or are you starting with a shrub and trying to make it a tree? i bought 3 macrophylla hydrangea and just found out they are poisoneous. i have a dog, what parts of the plant are poisoneous. can i contain them in pots and prune them yearly thereby protecting my dog? Yes, according to the US Army center for Health, the flower buds are the most poisonous. Symptoms after injestion: cyanide poisoning, abdominal pain, vomiting, & lethargy. I have changed by dead pinky winky with a paniculata Grandiflora (tree type). Two items appear in the messages above about other types of hydrangeas : using 10-10-10 fertilizer and not fertilizing after August 1st. Does this apply to this type of hydrangea too? You can use a special formulated fertilizer for hydrangea 10-10-10 is a general fertilizer that works for most plants. Fertilizing and pruning applies to all hydrangea. You don’t want t encourage new growth after Aug. because the new growth may not have enough time to harden before cold weather sets in. I live in southern Indiana and am just starting to garden – learning still. Is it possile to divide an Annabelle hydrangea? I haven’t tried it, but hear it is possible provided the root ball is large enough to divide. Best time to do this is in late winter/early spring when it is dormant. I am in zone 4 and have a PeeGee Pinky Winky (tree not shrub) hydrangea planted last spring (2008). It was glorious all last summer, but now it is the last week in May and still no leaf buds. Is it still viable? It should have started to leaf out by now. They are hardy to zone 3 -7. It may not have survived the winter. Scratch the stem and see if there is any green (life) to it. If not, some nurseries have a warranty and may replace it for you. Most hydrangea are listed as heat tolerant to zone 9 except for H. paniculata (zone 8). Plant in a shady spot so that they can tolerate the summer heat. For cut flowers for the table.I bought some hydranga flowers and they went droppy. Is there anything I can do to bring them back. Also from my garden when I cut some from my hydranga bust, what can I do to keep them looking full and nice. One more question; and if I want to dry them, what is the best thing to do. Cut flowers early in the day. Try recutting them when they are drooping. For drying hydrangea, timing is important. Softly squeeze the flower and feel for a slight papery resistance, check all florets then cut and place in a vase and let dry. Another method is to cut the flowers place in a vase full of water and let the flower absorb the water and then allow it to dry. Hydrangea flower heads can be preserved in cat litter. It’s cheaper than using silica gel. Should I wrap my Niko Blue in Burlap or Plastic to survive a Northern Montana Winter or should I just leave it uncovered? Nikko blue is listed as hardy zone 6-9 but can be grown in zone 5 with winter protection. It is marginal in your area so you need to protect it from the winter. In November after a hard freeze, tie the stems together with twine, then slip a plastic rose collar over the plant and fill it with pine mulch, leaves or straw to cover the crown. For larger plant make a collar from a small garbage can(open top). Wrap mesh hardware cloth around the cone or can to keep it in place. Another way is to wrap it with hardware cloth or chicken wire and fill it with pine bark and then wrap the outside with permeable landscape cloth or burlap. The insulation should be able to “breathe” and maintain an even temperature. If a plant is wrapped in plastic it can get too hot in the winter sun and then freeze when night temperatures drop. I’m not sure what type of hydrangea you have. My guess is that its a H. paniculata (PeeGee) or H. arborescens (Annabelle). Both bloom on new wood, therefore you can cut the old stems to the ground or 6″ above the soil line, in LATE winter and still have flowers. Fertilize in the spring when new growth appears. Julie, I’m glad I could be of help. Yes, you can cut off the brown stalk up to the green part. Don’t cut off any green growth because you really don’t want to stimulate the plant to start new growth as it may not harden off before winter. If the flowers are unsightly cut them off otherwise you can leaves them. Cut the flower heads right underneath the base of the flower. After I planted my hydrangea it wilted and the leaves on top of the stalk turned brown. I pruned them off, but they never got new leaves where the old ones were. The new leaves came lower and I have a bare stalk above. The flowers also had brown spots, Why is this? Your hydrangea, most likely, had some dieback from transplant shock when the stalks turned brown. The new leaves at the base are a good sign that the plant is growing and will survive. The brown spots on the blooms indicate a fungal blight disease that is spread by overhead watering and spraying. Mulch around the plant with 2″ of organic material to maintain even moisture. I have a blue endless summer hydrangea. It has been blue for the past two summers I have had it. This year we have had sooooo much rain (Southeastern Maine) and now the blooms have turned blue. I understand the ph soil thing and assume the heavy rain must have had some impact. My question is whether it is too late(Late August) to try/or too late to bother to change the blooms back by treating the soil. Should I just wait and see what happens next spring? I’m assuming you meant the blooms turned pink. Treating the soil this time of year(August) will not change the color of the blooms on your hydrangea but it can lower the ph which will help for next year. To change the color of bloom, start treating the soil on a regular schedule with aluminum sulfate in spring as soon as new growth starts and before flowers form. You may want to test the soil ph before starting treatment. If your plant is in a container, soil ph will be much easier to control. Conversely, if in the ground, your soil may be more alkaline and trying to maintain blue flowers can become an endless battle. Two Questions….. (1)I have had a hydrangia plant for the past 10 years but it has never bloomed. It’s very large. It gets some sun and shade throughout the day. In the late spring I have trimmed back, what looks like, dead stalks. (2) Just this year, however, I have noticed several new hydrangia plants scattered throughout my garden, some with pink blooms. How’d they get there? You may have a H. macrophylla that blooms on old wood(last year’s growth). It may not bloom for several reasons 1. too much shade 2. cold damage 3. pruning. Your hydrangea may be marginally hardy in your area in that the flower buds freeze in the winter or late frost in spring. If it is too large ,cut it back by 1/3 – 1/2 this fall and see what happens next season. You have nothing to loose. Protect it as you would a rose bush to keep the stems from freezing. For winter protection mulch it with pine bark, leaves. One elaborate way is to trim the foliage and tie the stalks together and then slip a plastic collar (made from a nursery pot) over the plant and fill it will mulch. Wrap the tied stems with landscape fabric. This will keep the crown and stems snug and cozy for the winter. You might have new plants from layering -a propagation method where part of the existing branch is covered by soil and eventually roots develop making a new plant. Another thing that might have happened is a neighboring hydrangea seeds and made their way to your garden. Are the new plants in more sun? If so there is a possibility that the large plant is in too much shade. I live in western MI. I have just planted two Spreading Beauty Hydrangeas. They have flowered and the flowers are now spent. Do I prune them now or in the fall and how do I prune? Also what type of fertilizer do they need and how often? Spreading Beauty hydrangea (Hydrangea serrata) belongs to the H. macrophylla which blooms on last season’s growth. Because your hydrangea is newly planted cut just below the old flower stem to a pair of leaves. If you cut further down you will be removing some flower buds for next year’s bloom. In the spring you may need to cut away any winter damage. Fertilize in the early spring with a balanced fertilizer and a second light feeding right after bloom but not later than Aug 1. You don’t want to encourage new growth that may not harden before the cold weather. It sounds like mealy bugs. ABOUT 5 DAYS AGO. IT GET 2 HOURS OF SUN IN THE MORNING AND ABOUT 4 IN THE AFTERNOON. HE WATERS IT ONCE A DAY. HE PUTS THE HOSE BY THE ROOTS FOR ABOUT 15-20 MINUTES. ALL THE LEAVES ARE COMPLETELY BROWN AND CRISP AND DROOPING. IT LOOKS DEAD ALREADY. WHAT ARE WE DOING WRONG? HOW CAN WE SAVE IT? You need to let the plant dry out between watering. Watering every day is too often and drowning the roots. Watering every 2-3 days depending on weather conditions would be sufficient. I don’t know if the plant will survive. We live in Evanston, Illinois, and have a huge Annabelle that is full and balanced at the beginning of the summer but separates after the first heavy rain. Do you recommend underplanting something around it to help keep the blooms upright? Thank you. I don’t think an under planting will help support your plant. Your Annabelle hydrangea will just flop over it. You can try some supports like peony rings. Since it blooms on new wood so you can get more aggressive with pruning. Cut it back to 1/2 in early spring so when it sends out new growth it will develop stronger stems to support the flowers. If you cut it more (6″ stubs) then you may get too vigorous growth and big flowers that fall over in a heavy rain. HAVE HYDRANGEAS THAT WERE HERE WHEN MOVED IN 4 YEARS AGO. HAD BLOOMED BIG BEAUTIFUL 1ST YR. NOW FLOWERS FORM, BUT ONLY A FEW BUDS OPEN LIKE A LACE CAP AND THEN ALL TURNS BROWN. THERE IS SOME LEAF SPOT LATER IN SEASON. WE ARE ZONE 5,HAVE SPRINKLER SYSTEM. PLANTS LOCATED NS SIDE SO GETS AM SUN AND EVENING. It’s possible, that you have a watering problem. If the sprinklers are spraying the flowers it will invite fungal and bacterial pathogens that cause the flowers to turn brown, in addition the water on the leaves can also cause the leaf spot. Its best to water the hydrangea at the soil line. I dont have a comment, but rather a question. I have a blue endless summer plant. I transplanted it in a large pot that sets on a patio in front of the house. It gets mostly sun from about 8 to 3. I noticed that a few of the blooms have been getting black on them. What could be causing this? Are the flowers getting wet either by rain or overhead spraying? Do you have any spots on the leaves? If so, you may have Botrytis on the flowers causing them to turn brown. It could also be environmental, such as too much sun, Endless summer hydrangea likes morning sun and afternoon shade (newly planted needs some protection until the roots are fully developed). My hydrangia plant stems are curling and twisting at all angles. What could cause this? Have you or your neighbor sprayed with any herbicides lately? Are the leaves distorted? I live in Milwaukee WI, near Lake Michigan. I have Nikko and All Summer Beauty-Serrata. I was told NOT to prune last fall. Now, this spring, I have long “sticks” coming out of the ground, with green leaves starting to form at ground level. Is this normal. I was told to put rusty nails in the soil around the plants to keep the blooms blue… is this true or just a myth?? What may have happened is that your hydrangea has some winter kill. The “sticks” were damaged by freezing temperatures and now its sending out new growth from the roots. If that is the case Nikkko blue will not bloom this season as it blooms on last seasons growth. Trim down any dead stems (be sure they are dead). All Summer Beauty should bloom this year even if damaged on any new growth. You may want to wrap or protect the Nikko blue next winter. Rusty nails is more of a myth-yes, you will get some minute amount of iron but that won’t affect the flower color and it’s not enough to green up the plant. We live outside of St Louis, I have a beautiful pink hydrangea and I don’t know what type of soil and drainage is needed to keep it healthy. Our yard is small but I do have full shade, part shade and full sun. From reading others notes, I understand it is probably best part sun. My biggest problem is water, our yard slopes toward the house. It stays wet for quit some time when we have even a little of rain. I would like it close to the house, but, it that is where the soil is very wet. After a rain it normally takes a few days for the soil to dry. Please help! You might want to consider building a raised bed toward the house. They are great for areas that have heavy clay or soil that drains poorly. Make it about 6 -8 inches high and fill it with well-drained organic soil with peat moss added which will provide good drainage and ideal root conditions. Replant your hydrangea in the raised bed and place a 2 inch layer of mulch on top. Ideal time is in early spring so you need to do it ASAP before it leafs out . My pink Hydrangia in a large container has fared very well the past 2 years. Now, in Dallas, its dormant and we are all ready for its showy early summer blooms. Can I break the root into 2 and repot the 2nd one? I really would love to see them in 2 separate pots. If you have a well established large plant, you can divide it while the plant is dormant or early spring. Be sure to tease out the roots and get 2 subtantial clumps of a rooting sytem. Uof GA.
How much sun is ok for hydrangeas? The patio gets some morning sun. Also, how often should they be watered? Hydrangea likes morning sun(min 3 hrs. of direct sun) and afternoon shade. Some varieties need more sun to bloom. In cooler climates it will tolerate more sun conversely in hotter climates will tolerate more shade. The patio sounds fine. Water in the morning an inch of water once or twice a week depending on the weather. Be careful not to overwater. I live in East TN. I planted a pink hydrangia several years ago. The leaves come back each year, but I never get to see the flowers, because the deer eat it. Is there anything I can do to keep the deer away? I just bought 4 of the new blushing brides (macrophylla’s) 2 are white and the other 2 are blue. While I haven’t got to enjoy my first bloom just yet something is enjoying my leaves while I’m waiting for my new babies to bloom. Any Idea’s on what it my be and whats safe as a pesticide to put on my plants? I live in the Southeastern part of Guilford County in North Carolina if that’s of any help….. In general, Hydrangeas have little insect problems but I’m sure something has found your plant appetizing enough to eat. Some insects that can attack your plant are rose chafers, four-lined plant bug (causes round brown spots on leaves), horntail. Examine your plants closely to see if there are any insects (some show up at night). I would suggest you take the damaged leaf to where you bought it or to the local extension office to ID the problem. They can in turn give you a recommendation for an insecticide. I have one oakleaf hydrangea (got last year) and is doing beautifully. already grew almost 4 feet. What do I fertilize it with and when. I also planted 13 Endless Summer Hydrangea ad they are doing great. What’s for fertilizing then and when. Thanks. Fertilize hydrangea in early spring as new growth emerges with a 10-10-10 granular scattered around base of the plant and outward and 6 wks. later after blooming to encourage healthy growth. Follow manufacturers application recommendation. Do not fertilize after Aug. 1st. i planted my hydrangia plants five of them about a week ago and last night we had a temps below 32 degrees and now they are wilted and maybe even a little brown will they be ok? Even if a plant is hardy, the emerging delicate growth is not as hardy as mature developed growth. There is not much you can do about the frost damage. Depending on the severity of damage, the plants may or may not recover. Wait and see, if the wilted branches do not recover prune them and you should get some new growth. If another frost is imminent cover the plants to protect the new growth. Depending on the type of hydrangea, you may have lost your flowers for the season. I have three hydrangeas and all three have died back to ground level this fall. One did the same last year. It had one small bud at ground level and I nursed it back to 18″ this year. What is causing them to die to ground level? It may be variety of hydrangea. Some are hardier than others and if you have one that is marginally hardy, perhaps a H. macrophylla, then it will die back from the freezing temperatures. Fortunately, the roots did not die and that’s why they send up new growth in the spring. Try mulching and protecting it as you would a rose bush to keep the stems from freezing. I have two Hydrangias planted outside that are 3 years old. The leaves are small, the stalks are tall and thin, the flowers are very large and too heavy for the stalks. I live in Southeast Missouri. Is there a way I can prune them to make them fuller and stronger? Heavy pruning will help keep your hydrangea compact but the pruning will depend on which hydrangea you have. If you have an “Annabelle” hydrangea, which blooms on new growth you can prune it down to 6 inches and it will come back next year full and stocky. Sometimes heavy rains or high nutrients in the soil from lawn fertilizer can cause the stems to grow fast but not strong enough to hold the blooms, try supporting them with a peony hoop or stake them up. Botrytis on the flower budsI HAVE A QUESTION….WHY DOES MY HYDRANGEA PLANT FORM BUDS AND THEN TURN BROWN AND NEVER BLOOM? The flower buds on your hydrangea may be infected with botrytis, a fungal disease also known as grey mold. It attacks all plant parts and is a results of rain, standing water, overhead watering or dew at temperatures between 32-84 degrees. Try to avoid any overhead watering that is usually the culprit. You can treat it with a fungicide before blooming to reduce the infection. Botrytis will winter over in the soil and on plant debris, so be sure to remove and destroy any infected plant parts. I have no green thumb, but my plants are doing extremely well. I would like sepecific, detailed information on pruning them. I have the hydrangias that bloom all the time. They are currently “loaded” with blooms, but I do not know how far from the flower to cut off. Some of the flowers are now spent and I want to prune them. I also am trying to figure out if I need to prune any of the green leaves. If you are just trimming off the dead flowers, cut them just below the flower up to the next set of buds. I would not prune any leaves at this time. Not knowing exactly which hydrangea you have it is best to prune it in early spring AFTER all the buds return, that way you will be able to tell what survived the winter. If you have a Hydrangea arborescens & paniculata (Annabelle & Pee gees)which grow on new growth you can cut them back 1/2 . This will shape the plant and encourage new growth with lots of flowers. What can I do about the white powdery mildew on my hydrangeas? Is it dangerous to the bushes? What caused it? I live in the deep south. Powdery mildew is caused by warm day temperatures, cool nights and high humidity, also plants growing in the shade with little air circulation. Hydrangeas seem to be susceptible to it. Some varieties are more resistant than others. Other than being unsigthly , it ususally does not harm the plant. For some remedies check the article on Powdery mildew. I have a HOBELLA & HOMIGO HYDRANGEA . Could you tell me what type I am dealling with as far as do they bloom on old or new wood. Also, what is the difference between a Hydranga with a small leaf or one with a large leaf, what character differences are there? Thanks a million for any info you can give me. Amanda S.
Hobella is a lacecap in soft pink and Homigo is a mophead pink-blue both are from the Hovaria series marketed under the Kaleidoscope culitvars of Hydrangea macrophylla. They bloom on old wood. I recentely purchased 6 hydrangeas. I left them in the pots for several days and all was fine. A week ago, I planted them in an area that is in the shade until the evening sun. Now all of the blooms are drooping to the ground and all curled up, and the leaves are drooping with some of them brittle on the edges. What did I do wrong? They are getting watered by the sprinkler system in our yard. I have done lots of research on hyrdrangeas before I planted them,and cant imagine what the problem is. Can you help! Please! Your hydrangeas are in transplant shock and need time to recover. As far as watering, the sprinkler is not the best way to water. It can cause more problems, try to water at the soil level such as drip hose. A general recommendation depending on the weather and temperature is an inch of water/twice a week until the plant is established. I bought my hydrangea 2 years ago, when i first bought it it was a gorgeous lilac and purple colour, after planting it in a large pot of it’s own the next summer it had turned a dirty pink colour! which i find very unattractive… how do i get it back to the colour it was? and what soil do i use? The trick to maintaining the purple color is to add aluminum sulfate into the soil. If you have alkaline soil you’ll need to add aluminum sulfate to maintain a lower ph-to get a “bluer” color. Start early in the season as the plant starts to grow, it will take a while for it to change. Continue adding al sulfate each month throughout the growing season to maintain the color. Can pink big leaf plants be changed to blue? Mine plants are dong very well, they are in a very good spot morning filtered sun with afternoon shade. Shoud I remove the blooms when they get old and turn to a greenish color? It depends if you have a H. Macrophylla and the right cultivar such as â€œNikko Blueâ€ â€œEbziandom or â€œMathilde Gutges.â€ They respond best and then the color may range from lavender to purple to blue. In order to get it to turn blue you have to treat it with aluminum sulfate in the spring and continue every month to maintain the acid soil required. Some like to save the blooms and dry them or you can cut them after they are done blooming. Macrophylla blooms on old wood so donâ€™t cut too much as it will affect next yearâ€™s blooming. What chemical should I use to change my hydrangea from pink to blue? It not as simple as adding a chemical into the soil. Two important factors needed to change color are 1. Low soil ph (around 5) 2. aluminum sulfate or sulfur will increase acidity and changes color to blue. Acidic conditions in the soil make it possible to convert aluminum compounds so that the plant can absorb it. Color change will only happen with Hydrangia macrophylla (Bigleaf) which has the pigments. A white-flowered hydrangea will never develop blue flowers irregardless of the soil ph. I have a“macrophylla” hydrangia that I have in a pot outside. How do I care for it over the winter here in Ohio? I understand it is poisonous and I have a dog so am concerned about bringing it inside. Anyway to save it by putting it in a shed to protect it? Yes, you can keep it dormant in a garage or area where it won’t freeze. Wrap the container with insulation to keep the roots from freezing. i just bought and planted a pitiful annabelle hydrangia today – october! should i add fertilizer at this point or wait until sping? also, since it is in a sad state, should i cover it this winter? Get it in the ground, do not fertilize as you don’t want any new growth on top. Mulch it well for the winter. It’s hardy zone 4-9 and is a tough hydrangea that blooms on new wood,therefore you can cut the old stems to the ground in LATE winter and still have flowers . Fertilize in the spring when new growth appears. What is the best time of year to plant hydrangeas? Best time is in the spring after danger of frost is over or in the fall before night temperatures get down to 32 degrees. Plant 45-60 days before the first expected freeze. When planting in the fall, apply 1/4 strength fertilizer to help establish roots and water well . Wilting Hydrangia leaves. Plant is pot and not exposed to hot sun. Was a transplant from the ground but now in a container. Leaves continue to wilt even when watered. Tranplanting will shock the whole plant including the roots. There are not enough roots to support the leaves. Keep it in a shaded, protected area until the plant revives. Be careful not to overwater as this will invite root rot problems, bottom water (let plant stand in water up to 45 min. them drain). How do I treat black spot on my hydrangea leaves? Leaf spots occur when you water overhead. Water on the leaves and humidity help bring out the fungus that causes leaf spot. It is unsightly but will not harm the plant. Once the fungus is present, there is nothing you can do for it. You can spray in the spring with a fungicide as a preventative measure or change your watering routine to water the soil, avoiding water on the leaves. Hydrangea macrophylla and H. serrata, bloom on old wood. In warm climates prune right after flowering, in cool climates leave the flowers on thru the winter to protect next yrs. bud and prune in the spring. Cut back to a healthy pair of fat buds (up to 12 in.). Hydrangeas that bloom on new wood can be trimmed right after blooming. My plant was fine until a few days ago when I fed it with an acid fertilizer. Now the leaves are turning brown at the edge and curling. It is in partial shade & sun. What happened? It sounds like too much or too high concentration of fertilizer and the plant is experiencing fertilizer burn. Too much applied fertilizer that is not watered in well produces a concentrated solution that makes it difficult for plants to absorb water. The plant is not be able to use all that fertilizer. Water the plant thoroughly to dilute and leach out any access fertilizer and let the water drain. Do this several times . I just bought a pink hydrangea. What kind (numbers ie 10-10-10) of fertilizer should I use to keep it pink. It depends on the type of soil you have. Some areas are naturally alkaline(pink) while others are more acidic. If the color starts changing, then change the ph of the soil and add lime to maintain a pink color. For general fertilizing, Michael Dirr, suggests using 4 oz. of 10-10-10 scathered outward around the base of the plant in early spring before the leaves emerge. He also recommends Osmocote or Nutricote. The color depends on the ph level in your soil. Apparently you have a lower ph in you soil causing the flowers to turn blue instead of purple. If you increase your ph by adding lime (sweetening your soil) your flowers will turn purple. I bought green, pink,and purple plants.The next year they all bloomed blue. How can I turn them back to their original colors? 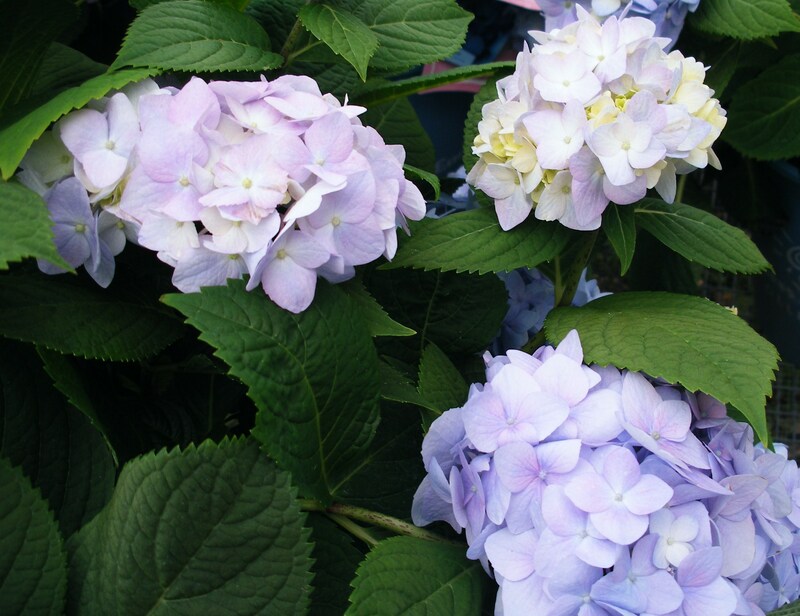 The soil in your area must have a lower ph in which hydrangeas naturally bloom blue. You can check the ph with a soil test. In order to raise the ph to 6.0-6.2 (which is best for pink color) you need to add Dolomitic lime several times a year to sweeten the soil. Use a fertilizer that has high levels of phosphorus (middle #) and no aluminum. Aluminum is easily taken up by the plant in lower ph soil producing a blue color; whereas higher ph reduces aluminum uptake causing pink blooms. Either you accept the natural growing habit of blue, try to change the ph, or grow your plants in a container where the color will be easier to control. i have a purple plant that turned blue.I repotted to a bigger container & now its green.My favorite is purple/HELP!!! When you replanted the ph of the soil was different, changing the color. Add aluminum sulfate to the soil. You will need to do this every month and it will take time for any change to show. The best time to do this is in the spring when the plant is just starting to form flowers. Chances are you will not see much change this year. But keep in mind that you’ll need to do this next year to maintain the blue/purple color. Blue color requires more acid than the purple so you will have to monitor your applications. The leaves curl and turn black or dark on the edges. Brown crisp edges indicate salt burn(too much fertilizer) drought strees, or soil compaction. I have a Tokyo Delight hydrangrea. Does anyone know what “type” this is so that I can determine how best to prune? Tokyo Delight is a cultivar of Hydrangea macrophylla, bigleaf hydrangea. Blooms on old wood so prune right after flowering. Blooms July-Aug. Hardy in zone 5-9 although 5 is “iffy” and can die back from winter cold destroying next years flowers. How do I know what kind of hydrangea I have, and how do I know when to prune if it doesn’t bloom? There are so many varieties and cultivars of hydrangea but they all basically fall into 4 categories. 1. Smooth hydrangea (Hydrangea arborescens) is hardy zone 4-9. This native shrub gets 3-4 ft. tall and has a rounded spreading form. The leaves are large and rounded, deep green. The flowers are cream colored rounded clusters . ‘Annabelle’ and ‘Grandiflora’ are popular varieties. It blooms on new wood so if you cut the old stems to the ground in late winter you will still have flowers the coming season. 2.Panicle hydrangea(Hydrangea paniculata) is hardy zone 3-8. It is the most hardy of all hydrangeas. This multi-stemmed shrub grow 10-20 ft. tall(some cultivars are smaller). The leaves are oval, dark green and deeply veined. It has cone-shaped clusters that have a blend of small and large ivory- white flowers ,that change to pinkish-bronze with age. Some varieties are ‘ Grandiflora’ or PeeGee, ‘Tardiva’, Brussels Lace’ and ‘Pink Diamond’. It also blooms on new wood. 3.Bigleaf hydrangea(H. macrophylla) is hardy zone 6-9. It has a mounded, wide spread form that grows 3-6 ft. tall. Leaves are deep green, large-oval shape. It is known for its lush flowers that come either in the globe-shaped form or lacecap blossoms. The “mophead” shapes are large, rounded blooms that consist of showy flowers ;whereas the lacecap group have flat showy flowers with small starlike flowers in the center. Among some of the varieties are ‘Nikko Blue’, Forever Pink’ and ‘Glowing Embers’. These bloom on old wood (last year’s growth) so prune after blooming for height. If you prune in early spring you will lose some flowers. There is a new variety Endless Summer (‘Bailmer’) that will bloom on old and new wood and is hardy to zone 4. If you prune this one at the wrong time it will still bloom the next year. 4.Oakleaf hydrangea (H. quercifolia) hardy zone 5-9. Ths multi-stemmed form grows 6-8 ft tall. Easily recognized by its oakleaf-shaped floliage and long conical clusters of flowers. Blooms on old wood, so prune right after flowering. Leave a Reply to Kiki Kraemer Click here to cancel reply.